What is the REAL reason for this trade? or Is NOW a good time for entry? Download this helpful Forex trading checklist to help you in your Forex trading. We are almost sure that this alone will immediately improve your trade entry. 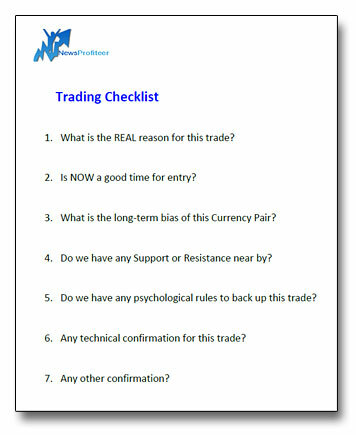 This Forex Trading Checklist is compatible to anyone, whether you are a technical or fundamental trader. For more information on the some of the live applications of this checklist, make sure to watch my 3-part news trading videos in the education section of the site where I talk about using the trading checklist in more depth. You can also get more information reading my 7-part Trading strategy in the Trading Tips section, also in the education section of the site… It covers the reason, support/resistance, and much much more in detail.